The OMB-CHARTSCAN-1400 is no longer available please see the OMB-DAQSCAN-2000 as a possible alternative or contact our data aquisition department. The OMB-CHARTSCAN-1400 is a next-generation recorder that combines the ease-of-use common in paper-based strip-chart recorders with the advanced features of PC based data acquisition systems. The CHARTSCAN’s convenient BNC, safety jack, subminiature plug, and screw terminal connectors make signal connection easier than other data recorders or loggers. The OMB-CHARTSCAN-1400 is a compact, portable instrument which scans at 147 readings/s. Because of its unique configuration, the OMB-CHARTSCAN-1400 offers an unrivaled low cost per channel. It connects to a computer via an RS-232/RS-422 interface, Hayes-compatible modem, or optional IEEE 488 interface; and can stream data direct-to-disk (your PC’s hard drive) in real time. For stand-alone operation, the OMB-CHARTSCAN-1400 comes standard with 128K readings (256 Kbytes) deep memory that is expandable to 4M readings (8 Mbytes). ChartView provides a number of data display options including a real-time smooth scrolling trend display, digital meters, analog meters, and bar graph meters. The collected data is stored to disk in an ASCII format so it may be easily imported into other applications, such as Microsoft Excel, for post acquisition display and analysis. In addition, ChartView also provides a real-time link to Excel using Dynamic Data Exchange (DDE). The OMBCHARTSCAN- 1400 also includes PostView, a post acquisition graphics display program that integrates seamlessly into ChartView. Using PostView’s intuitive on-screen controls, you can expand, contract and auto-scale waveforms as well as scroll in either direction. PostView also provides hardcopy printout of the waveform. The Standard ChartView is included with the OMB-CHARTSCAN-1400. An optional enhanced version of ChartView, ChartView Plus, is also available. The table to the right summarizes the differences between ChartView and ChartView Plus. The OMB-CHARTSCAN-1400 is ideal for temperature and voltage measurements that require channel-to-channel isolation. The OMB-CHARTSCAN-1400 provides 500 V isolation for high voltage applications using the OMB-CSN14-HV-S module and 200 V isolation when the thermocouple and other voltage modules are used. The OMBCHARTSCAN- 1400 achieves this high isolation by using individual relays on each channel, yet still maintains a very fast 147 channels/s scan rate. The OMB-CHARTSCAN-1400 offers a faster scanning than typical strip-chart recorders and exceeds the typical two Hz rate found on most strip chart, multi-point or hybrid recorders. The unit provides an array of scanning capabilities to meet your applications requirements. Because data-logging and chart recording applications frequently require the logging at fixed time intervals, the OMBCHARTSCAN- 1400 uses the standard hours-minutes-seconds (hh:mm:ss.s) format to specify the time interval between channel scans. Users can configure the unit to begin and end data logging on a specified event such as TTL signal, temperature level, IEEE GET, alarm condition, absolute time of day, or upon completion of a specified number of readings. 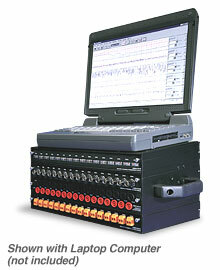 The OMB-CHARTSCAN-1400 can accommodate up to four plug-in option modules a total of 64 channels. When line-cycle averaging is enabled, the OMB-CHARTSCAN-1400 can average 1, 2, 4, 8, 16, or 32 samples per channel. When the unit is configured to take 1 sample per channel, it can scan 147 channels/s or all 128 channels in under one second. This is important when trying to time-correlate a large number of channels. The OMB-CHARTSCAN-1400 has a number of features and capabilities that enable it to deliver the high accuracy demanded by many research applications. The OMB-CHARTSCAN-1400 is equipped with a high-speed 16-bit A/D converter. This enables the OMB-CHARTSCAN- 1400 to offer up to 0.1°C and 3.05 µV resolution with the OMB-CSN14-TC-P thermocouple/volt scanning module. Detecting an alarm condition is a common requirement in logging applications and the OMB-CHARTSCAN-1400 offers a number of modes to facilitate alarm detection. With 32 digital TTL alarm outputs available on the 50-pin rear panel connector or 16 outputs via the high-current capacity OMB-CSN-RELAY option, multiple conditions can be set and monitored. Unlike some instruments which allow only one channel to be assigned to a single alarm output, the OMB-CHARTSCAN- 1400 allows one or more channels to be logically “OR-ed” and connected to an alarm output. OMB-CHARTSCAN-1400 input modules are ideal for making isolated temperature and voltage measurements. Each features 16 isolated inputs and plugs directly in the OMB-CHARTSCAN-1400. Depending upon the module and signal input, each card uses either standard BNC, safety jack, removable screw terminal block or thermocouple plugs for quick and easy input connections. The modules slide into a shielded metal enclosure within the OMB-CHARTSCAN-1400, keeping noise to a minimum and maintaining a stable internal temperature for accurate CJC reading. All scanning modules for the OMB-CHARTSCAN-1400 feature isolated differential input capabilities that can make accurate measurements in high common-mode voltage applications.